This apartment is in a quiet but central part of town, and is in the same building as our other Bergstrasse properties. Only 200 metres from the ski lift, only 400 m from the lake and beaches, just 30 metres from the icerink and swimming pools and the shops and restaurants are very close. It is an ideal location. 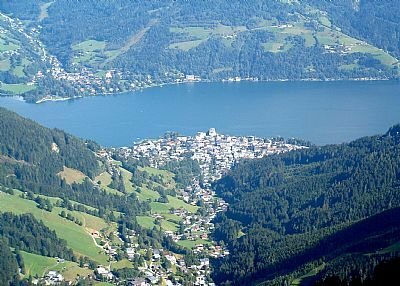 Zell am See is a beautiful lakeside alpine town nestling in a large sunny valley. It is only one hour from Salzburg and easily accessible by the budget airlines. Zell is a truly all year round resort with heaps to do and see in both summer and winter. It is a friendly and family oriented ski resort with great facilities and this apartment is right in the heart of it. Our apartment is on the third floor of a modern chalet style building. It is a large studio apartment but it will scomfortably sleep 4 persons with a double sofa bed in the lounge and 4 bunks in a sleeping area separated from the main living area by a partition. This is by no means a luxury apartment but it is very well equipped, newly decorated and furnished and is really homely, sunny and comfortable.The apartment now also has a lovely new shower room, with oversize shower, plentiful hot water and top grade fittings. This is a great little economical apartment for singles groups or families. It also has a large sunny balcony containing tables and chairs with views of the ski slopes and mountain It has a living area of 40m2 plus the balcony. There is good storage in the lobby. The toilet is separate from the bathroom, There is a well equipped kitchen and dining table, which seats up to 8 persons. Storage for skis etc and washing machines etc. in basement and private parking at rear of building. It has a lift to all floors. Ideal for small groups or families with teens or young children on a budget and represents great value for money. Storage for skis and washing machines are in the basement, with private parking at the rear of the building. It has a lift to all floors. There is also FREE WI FI in this apartment. Parking is free but on a 'first come first served' basis.